geekguyandy wrote: More interesting news from Philae - it bounced multiple times! The sensors detected 3 landings, at 15:33, 17:26 and 17:33 UTC. Notice that nearly two hours passed after the first bounce. Given the microgravity, how high a bounce would that be? Could it be instead a sensor malfunction, or a pad not being quite down? I think it was the whale, slapping it away with its tale, before it could operate the harpoons. seems like Philae is laying sideways. or only two of three feets are touching the ground. also, it doesn't get enough sunlight which reduces the time it can be used. edit: scientists also say that the harpooning mechanism was activated, but the harpoons didn't fire/release. LordHorst wrote: seems like Philae is laying sideways. or only two of three feets are touching the ground. also, it doesn't get enough sunlight which reduces the time it can be used. so, do harpoons work on comets? apparently, no. geekguyandy wrote: The second bounce was only 3cm/s for 7 minutes, without much more movement. It now rests on it's side with one foot up. The batteries were in two systems - one which is sufficient for all the initial science data, and another that relies on solar power to extend the mission by several months, but they now fear that the final resting place next to a cliff wall will only provide 1.5hrs sun/day compared to the 6hr/day the planned landing site would have provided. That's comet days, so almost 3 hours of sun per Earth day. I think the harpoons will turn out to be a Chekhov's gun. Last edited by Klear on Thu Nov 13, 2014 8:29 pm UTC, edited 1 time in total. Can they shoot the harpoon to lift the lander while also tethering it to the comet, allowing it to "bounce" again when it rebounds at the end of the tether line and maybe land somewhere nearby that's better than its current location? Or even (if it would be useful, and possible... not quite sure how the physics work out here) hang out at the end of the tether line, being pulled along (or swung around) by the comet without actually being on its surface? Philae: "I wonder where I'll bounce next." Eternal Density wrote: Philae: "I wonder where I'll bounce next." Then vanish like a Cheshire cat, and not like a Heisenberg cat. Is it just me, or does the comic now hyperlink to http://xkcd1446.org/#142? rivulatus wrote: Is it just me, or does the comic now hyperlink to http://xkcd1446.org/#142? It has linked there for quite some time. Another thought: since the comet isn't that big, why didn't they give Philae a cord of 7km to wrap around it? 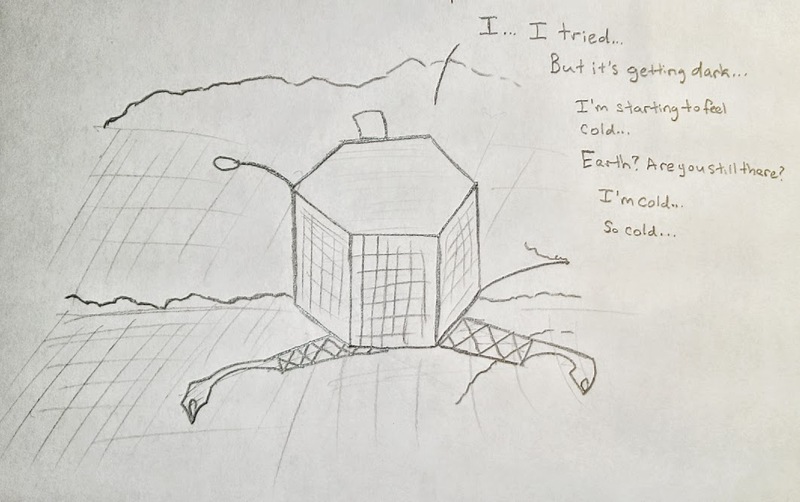 It doesn't even have to be a strong rope, just enough to withstand the little bounces (specifically the stresses it causes in the rope) of the lander. Split the lander in two, cord in between and reel it in once the two halves are together again at the other side. geekguyandy wrote: In the briefing they said that the first bounce (of nearly 2 hours) launched the craft up about 1km from the landing site, and because of the rotation of 67P and the angle of bounce, it translated about 1km away from the landing site. It initially hit at 1m/s (as planned) but the cold-gas thruster, harpoon system, and grappling system in the feet all failed, and the bounce resulted in a rebound of 38cm/s. Argh, I hate extraterrestial motion. Normally, a vertical velocity of 38cm/s gets you 7mm off the ground for a total of 77ms "flight" time. Moreover, Rosetta was still millions of kilometres away when entering hibernation and it slept for two-and-a-half years. Perhaps to someplace with mommies. Catching a comet with a giant set of bolas would be at least 84% as awesome as harpooning one. And now that we know comets are not harpoonable, I approve of this mission. The comet is purring. I don't think you want to harpoon something that's purring. Pfhorrest wrote: Can they shoot the harpoon to lift the lander while also tethering it to the comet, allowing it to "bounce" again when it rebounds at the end of the tether line and maybe land somewhere nearby that's better than its current location? Or even (if it would be useful, and possible... not quite sure how the physics work out here) hang out at the end of the tether line, being pulled along (or swung around) by the comet without actually being on its surface? I hope they are going to try such a move, but not just yet. It would have quite a big risk of going over the escape velocity (1 m/s) and thus loosing Philae. In this position they can do some research, so I expect them to do that first. Once the battery level gets low enough that not much research can be done but the move is still possible I hope they try something to get Philae upright and in a better position. At that point not as much is lost by failing. Neil_Boekend wrote: It would have quite a big risk of going over the escape velocity (1 m/s) and thus loosing Philae. That's why I was picturing the tether actually attaching to the comet as Philae is pushed away; when Philae reaches the end of the tether line, the line goes taut and Philae rebounds again, back toward the comet, to attempt another landing in a better position. Or depending on how far up the tether line can reach, and how quickly the comet is rotating (can the tether line reach out outside geos... er, uh, comet-o-synchronous orbit? ), possibly swing Philae around at the end of the tether line, though I'm not sure Philae could do anything useful from that distance. Yep, that is what one would hope to achieve. However, what happens if the tether doesn't hold? If they would attempt it now valuable research time would be lost. Better to try it when there isn't as much to lose. Neil_Boekend wrote: Better to try it when there isn't as much to lose. Shouldn't take too long. They were claiming that there was 50 hours of battery power. eidako wrote: Edit: and now she's linking back here. Finally checking back in here to say, thanks for all the updates! It's like a curated news feed for all things Philae and Rosetta. I was gone all day at school and working on an extremely frustrating programming project, so I missed the updates about it bouncing and re-attaching. I'm still hoping for some space harpoon action. And thanks taixzo for the KSP video! 60 hours of battery life isn't much, but here's to hoping it's enough. I'm a little concerned about how they're even gonna drill. They aren't anchored down and it certainly seems like Philae is sitting at an unstable angle. Poor thing. I start getting SAD around this time of year, but I should be grateful that at least I'm not directly solar powered. orthogon wrote: Poor thing. I start getting SAD around this time of year, but I should be grateful that at least I'm not directly solar powered. Yeah, being Batman is way better, anyway. May I just say: Damn you, Randall, for making me (and probably most of us) believe that Rovers and Landers have human feelings and emotions. I'm so sad that poor little Philae is lying on it's side, doing its job as good as it could. Snagglepuss wrote: May I just say: Damn you, Randall, for making me (and probably most of us) believe that Rovers and Landers have human feelings and emotions. I'm so sad that poor little Philae is lying on it's side, doing its job as good as it could. I think he was trying to portray Philae as more excited to be there, brave, not so heartbreaking as Spirit. "Battery power running low. Can't charge using my solar panels. But I've got to send this drill results. A good robot would be able to send these results, a good robot like ESA wanted." "Hey Earth, did you get my transmission?" "... can I go home now?" There is a "writing prompt" on Reddit this morning, that you live on the comet and Rosetta is coming. From the updates this morning, a woman from the battery team claimed that the solar panels and images now indicate that Philae is on all three lander feet, and has not moved since the first panorama was taken. I'm a bit confused how this is possible based on what was reported before. I'm guessing that the talk of drilling must mean that it's in a proper position as well. Now they just think it's located between a wall and a rock, and not receiving much solar power. There's a bad situation where the batteries have to be warm enough to be useful, but it takes power to warm them up of course. Currently it is not receiving enough light for this to happen, so it will likely run out of power and be unable to recharge. "Still no plan to execute the harpoons"
Last edited by geekguyandy on Fri Nov 14, 2014 6:01 pm UTC, edited 1 time in total. It's between a rock and a hard place, you say? Any updates? It got so quiet around here. sdnelso2 wrote: Any updates? It got so quiet around here. I don't know if it's worth a redraw or not, but based on what we've seen, I feel like Philae should be in a bit more of a crater / cave / not out in the open. Then again, we don't really know where he is. I hope he wakes up again, it would seem unresolved if he just fell silent to Rosetta's increasingly urgent calls. Especially after the 10 years they had together. It seems that Philae is back online, the drilling was successful (? ), and Philae was able to rotate to get a bit more solar power. I hope there's a chance that they'll leave the lander sitting there for about a year (by then the comet is at its closest to the Sun) and then try bouncing up again and flying to a nice spot on top of a 'hill'. If that works out, Philae can try out its harpoons again and it can continue working for several years, if not decades. Anthropomorphizing Philae is making her potential loss agonizing. "Rosetta? Are you there? Please help me... I'm scared... I'm dying and I'm scared... please... please... please..."
I'm sexually attracted to the International Space Station. You have now had your daily dose of Internet.